Till the British started ruling India most of the castes were educated and prosperous but the delicate policies of the British are responsible for their later condition. The Brahmins who were supposed to set the standards of behaviour in the society were targeted, and when they strayed away from their path they were blamed for the condition of the other castes. During the time of the East India Company and later, in the British rule, there seem to have been two motives working in the minds of the rulers: plundering the wealth of this land and the 'white man's burden ' of civilizing the natives (the term used by them to refer to all Indians). We shall see, how in order to achieve these ends, the British so cleverly played their cards that even after fifty years of independence we still continue to exist in a state of stupor, unable (and even unwilling!) to extricate ourselves from one of the greatest hypnoses woven over a whole nation. Perhaps many of us do not know that India was the richest land till the British came here. Whereas Britain's share in world exports before was only 9% as against India's share of 19% today our share is only 0.5%. Most of the foreigners came to India in search of her fabulous wealth. Ernest Wood, in the book "A Foreigner defends Mother India" states, "In the middle of the eighteenth century, Phillimore wrote that 'the droppings of her soil fed distant regions'. No traveller found India poor until the nineteenth century, but foreign merchants and adventurers sought her shores for the almost fabulous wealth, which they could there obtain. 'To shake the pagoda tree' became a phrase, somewhat similar to our modern expression 'to strike oil'." In India 35% to 50% of village lands were revenue free and that revenue was utilised for running schools, conducting temple festivals, producing medicines, feeding pilgrims, improving irrigation etc. The British in their greed brought down the revenue free lands down to 5%. When there was a protest they assured Indians that the government would create an irrigation department to take care of irrigation, an educational board to take care of education. etc. The initiative of the people was destroyed. But the rulers found to their chagrin, that though they had conquered this nation, it was still strongly rooted in its own culture. They found that as long as the nation was aware and even proud of its traditions, their 'white man's burden' remained as 'heavy and cumbersome as ever'! India had, at that time, a very well spread system of education and that system had to be made ineffective for their purposes. Now, most of us are taught to believe that the education was in the hands of the Brahmins and in Sanskrit medium and that the other castes had no education. 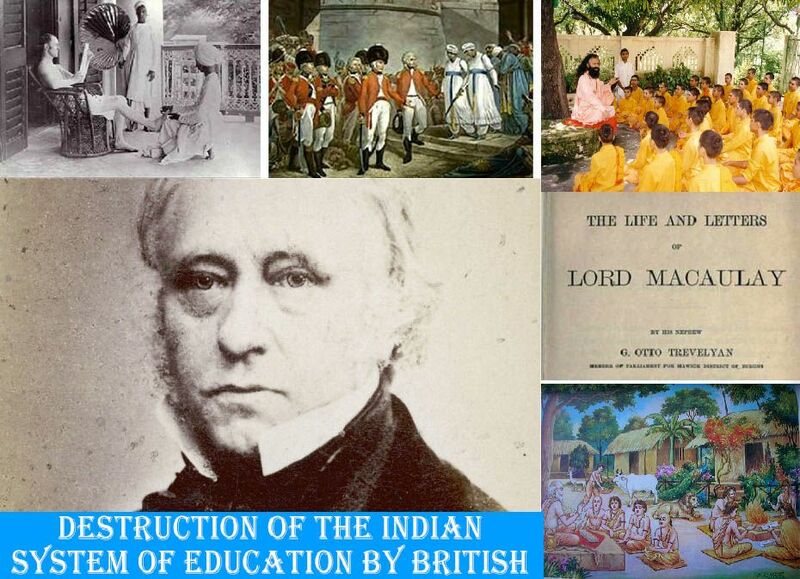 But here are the facts about how the British destroyed the Indian educational system and made one of the most literate nations illiterate.